Once you try Hog City Oysters you won't go back to any other type. 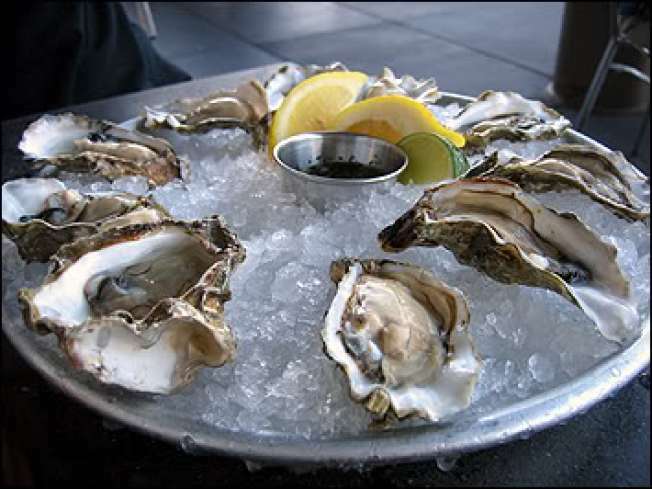 I had my first raw oyster at one of the ubiquitous waterfront restaurants in fisherman’s wharf, about eight years ago. It was one of the most revolting things I’d tasted up until then, which came as a surprise to me given my fondness for oysters in general. I avoided the slimy things until two years ago, on that fateful day when my friend, Dom, and I accidentally ended up ordering them at the Seafood Peddler in San Rafael. We swallowed the oysters like champs, and that was the end of that. Until now. I’ve finally gotten around to paying Hog Island Oyster Company a visit. Twice in one month, even. People say that after eating the oysters at Hog Island, they’ll never taste good anywhere else again. I think they may be on to something. Perhaps before I’d just been eating mediocre raw oysters and missing out on all the sweet, briny goodness at Hog Island. Oh, and it doesn’t hurt either that they serve bread from Acme Bread Company and the richest, most flavorful butter I have ever tasted.